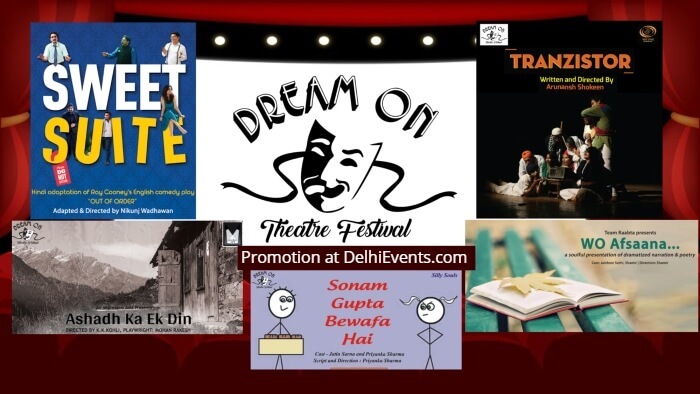 DreamOnTheatreFestival is a celebration of diversity & uniqueness of each genre of emotion and the courage to dream. There are a vivid set of genres with strong characters from plays ranging from 1970 classic 'Ashadh Ka Ek Din' to the sufi journey of Sahir Ludhianvi in 'Wo Afsaana', along with a comedy drama on India's partition 'Tranzistor Untuned', with a take on women defamation remembering the viral gone Rs.10 note stating 'Sonam Gupta Bewafa Hai' and the 35 year old rib tickling comedy Out Of Order adapted to hindi play 'Sweet Suite'. If all the stories have something in common it's the emotions & powerful characters & actors. About the production/organizers : Dreaming Stage is a theatre production company established to provide real entertainment to the audience and change the theatre trend.